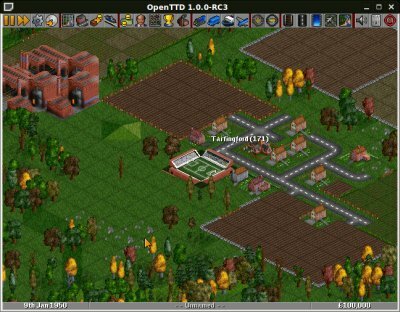 OpenTTD 1.0 has just been released! And do you know what this means? A whole new era of gaming fun. Let me put it in another way: What if you cannot locate your original Transport Tycoon Deluxe files, which are required to play Open Transport Tycoon Deluxe (OpenTTD)? Does this mean you are stuck forever without the ability to play the finest business simulation game ever made? Does this mean you should curl in a corner and cry in despair? Definitely not. 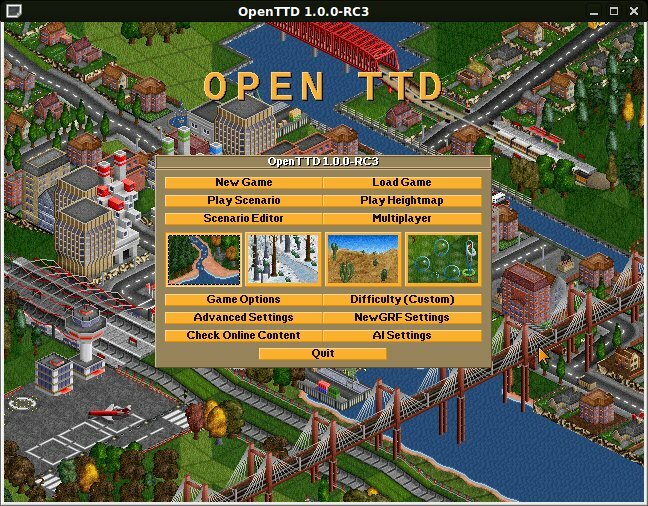 The people behind OpenTTD have set a noble goal of replacing the legacy graphics files in the original game with free, open-source alternatives that will enable anyone to play the game. Furthermore, this will allow people already using the original graphics and sounds to switch back and forth between the old and new media. Today, I would like to show you how you can do this. 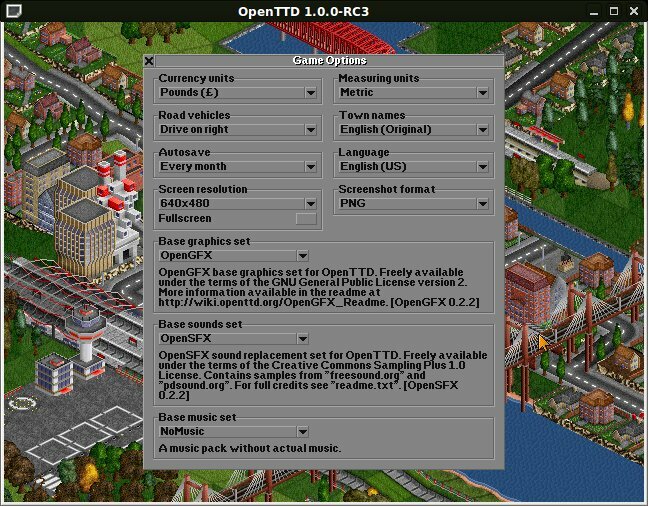 Trying to run the game even with the free graphics and sound files in place will throw a warning about one or more original files missing, the full list of which you can find in my tutorial on setting up OpenTTD with legacy content. Luckily, OpenTTD removes this limitation forever. Now, let's see how we can freely unlock the game. Windows users have a privilege of getting the files automatically. Just run the installer and it will offer you the ability to download the missing graphics, sound and music files. Job done, you now have a fully free OpenTTD version available. Power on and play. The manual method is currently the only option available for Linux users, but Windows users can also try it if they encounter problems with the automatic installation. To download and install the files manually, you will need to do a few things. They may seem slightly cumbersome at first, but it's quite simple really. First, take a moment or three to carefully read the game release README.TXT file, available online, which explains the procedure in detail, although without any screenshots to aid you in your quest. Not to worry, I'm here to help. The manual refers you to three download pages, where you can find the free graphics and sound files. What you need are: OpenGFX graphics files, OpenSFX sound files and OpenMSX music files. The files are available in .zip and .tar.gz format, plus the MD5 sums. Download the archive you feel most comfortable working with and save them somewhere to our disk. Next, extract them. After we install the game, we will copy them into a relevant folder. Alternative method: if you already have the game installed, you can extract the archives directly into the game data folder, although I do recommend you take the intermediate step and extract them first before manually copying them. This way, you can avoid mistakes. You can install the game by downloading it directly from the website or use the package manager in Linux. 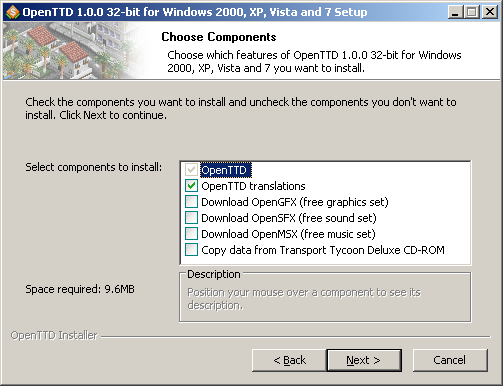 There are generic binaries available for Linux, as well as special versions compiled for different distribution flavors. After the game is installed, before you run it, copy the extracted graphics, sound and music files into the data sub-folder. The location of this folder varies, depending on the operating system and installation method. 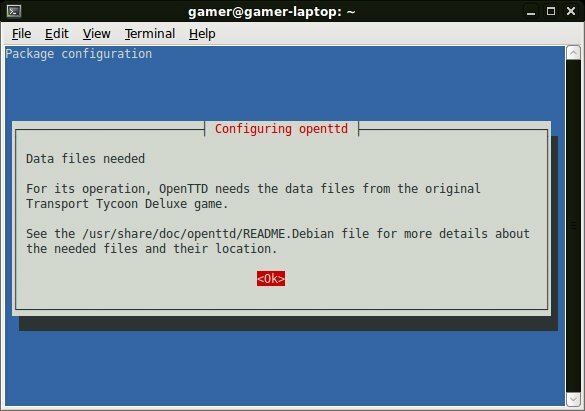 For instance, if you have used a generic Linux binary, the game will be found anywhere you chose to place it, most likely your home directory. If you installed from the repository, it's most likely under /usr/share/games/openttd. On Windows, you will find it inside the game installation folder, most likely Program Files. The README.TXT suggests several possible locations. In fact, when launched, the game will search for the graphics and sound files in several locations, including personal and shared folders. Therefore, taking the Windows platform as an example, you could place the files into your My Documents folder or the Shared Documents folder, under OpenTTD, and this is fine. Repeat for the graphics, sound and music files. Copy the extracted files into C:\Program Files\OpenTTD\data folder. And that's it, you're ready. Launch the game. Under Game Options, you can choose the base graphics, sound and music sets. If you have the original files, they will be available in the drop down box. If you're only using the free replacement, you will see OpenGFX, OpenSFX and hopefully OpenMSX in the menu options. And you can play now. The visual difference is very small. The alternative files offer very high fidelity to the original game, with some small changes. But there's nothing drastic to turn you off. In fact, this is a superb opportunity for all those people who did not have the chance to play OpenTTD so far. There you go. Free graphics and sound are a blessing to an already blessed project. You now have the ability to play Transport Tycoon Deluxe, in all its simple yet powerful glory. Even if you never owned the original game, even if you have misplaced the game and cannot find it, even the old floppies and CDs are damaged beyond recognition, OpenTTD is waiting for you. This is a beautiful game and you won't regret playing it. Take the leap of faith, install it and start torturing your mouse-hand wrist tendons, because you won't want to stop. Ever. By the way, a fresh 1.0 review coming soon!